Lock in a great price for Hayot Hotel – rated 8 by recent guests! Rooms are big. Receptions are friendly. They have okey breakfast. Big and clean room . Sweet staff . No need converter . Nice breakfast . Good place to stay about 10 minutes from airport with free shuttle service. Ulugbek picked us up after. Midnight which we appreciated he also let us stay longer in room as flight was mid afternoon. Very good. breakfast pleasant oasis after 2 weeks ho!iday before flying home. чисто большой номер хорошая отделка, внутри и фасад возможность образа в бане, бассейне трансфер завтрак нормальный персонал в целом, для моего маршрута передвижения по городу - очень хороший вариант. для прогулок по центру, не очень. Upgrade naar luxe kamer! Geweldig! Restaurant was goed. Vriendelijk en behulpzaam personeel aan de balie. Gratis shuttle naar vliegveld. Located 2.5 mi from Tashkent International Airport, this 4-star hotel offers free Wi-Fi and a breakfast buffet in an elegant setting. Hayot hotel features an indoor pool and spa facilities. Rooms at Hayot feature bright decor and come with a flat-screen TV, air conditioning, and tea/coffee facilities. Each one has a private bathroom with a bathrobe, slippers, and free toiletries. A daily breakfast is served in the hotel’s restaurant, which also serves European and Uzbek dishes. Guests can also enjoy drinks at the hotel’s bar. The hotel’s spa facilities include a sauna, massage services, and a gym. A concierge service is available as well as laundry and dry cleaning services. Guests can access a ticket service and tour desk at the hotel’s 24-hour reception. Hayot is located 5 mi from Tashkent city center and 3.7 mi away from Tashkent Train Station. A free one-way shuttle service is available from the airport to the hotel. When would you like to stay at Hayot Hotel? 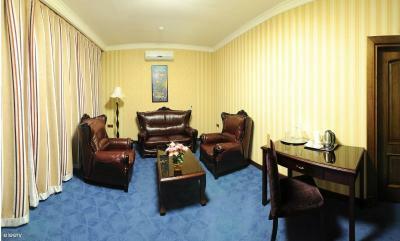 Bright room features a flat-screen TV, air conditioning, and tea/coffee facilities. Private bathroom includes a bathrobe, hairdryer, and free toiletries. Bright suite features a flat-screen TV, air conditioning, and tea/coffee facilities. Private bathroom includes a bathrobe, hairdryer, and free toiletries. The suite comes with a hot tub and a seating area with sofa. Bright, elegantly decorated apartment features a flat-screen TV, air conditioning, and tea/coffee facilities. Private bathroom includes a bathrobe, hairdryer, and free toiletries. The extra spacious apartment comes with a hot tub, a dining area and a seating area with sofa. Please note that the rates for this apartment includes a free return transfer to Tashkent International Airport or local train station upon request. House Rules Hayot Hotel takes special requests – add in the next step! Hayot Hotel accepts these cards and reserves the right to temporarily hold an amount prior to arrival. Please note that hotel does not accommodate non-married Uzbek couples. All couples wherein at least one person has an Uzbek citizenship must present a valid marriage certificate upon check-in. Please note that the hotel accepts cash payments in local currency and card payments in USD only, according to the local legislation. It is far away to center of the city when you compare the price. Air conditioner was not working properly. You ask extra towel; they give difficulty. No elevator; you have to carry all your luggage yourself second or third floor.